Perfect place for the two of you to relax and unwind. This lovely self-contained house is situated on the upper floor of our split level home. The entire top level is your private sanctuary with your own entrance and living. North-westerly aspect that takes in all day sun, with panoramic sea views, situated in a lovely bush and garden setting. Wide open deck with lovely views of Lion Rock. Large outdoor table, chairs, benches, with sun lounger, perfect for catching on your favourite reading. Lovely bedroom with comfortable queen bed. Modern bathroom with shower. Luxury linen and bathroom towels provided. Proper, well-kitted kitchen. Comfy lounge and indoor dining. Gas BBQ. 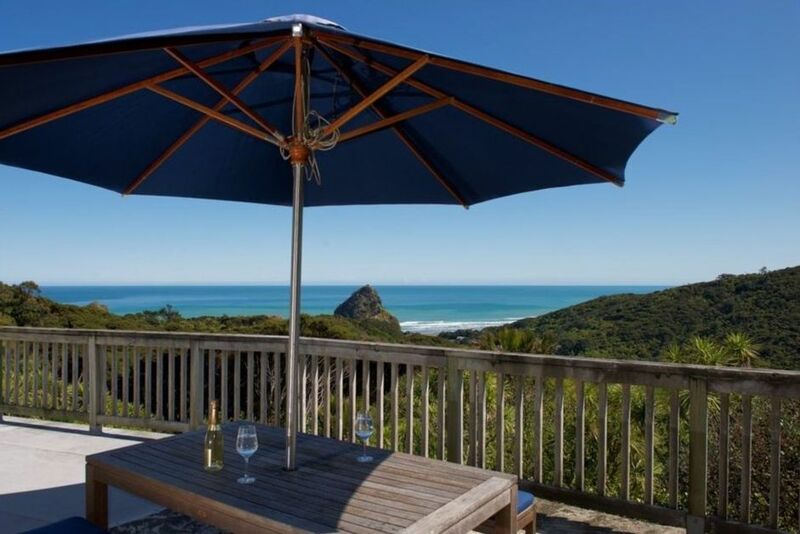 A sanctuary away, perfect for time together and to enjoy wonderful Piha. The TV is setup with Freeview Satellite TV and DVD player, or you can plug in your laptop via HDMI cable supplied. Stereo has CD player, and a 3.5 mini-jack to plug into your mobile for playing your favorite music. Kitchen has glassware, crockery, cutlery and cooking utensils. There is a stove top oven, microwave and a fridge freezer. Gas BBQ too. There are oil fin heaters that make things warm and cosy, and there are a choice of blankets and throws. It gets all day sun and so heats up nicely. Simple fan for cooling things down. Cosy, easy and breezy, a lovely way to enjoy the wild west all year round! Walking along Piha's beach expansive black sand and wild surf beach is an experience not to be missed. There is of course Lion Rock, which one can walk up if feeling very adventurous. Please note the surf can be unpredictable and swimming between the flags absolutely necessary. Piha is a quaint community, with a local store for basics. There is an art gallery, library and dining at the Surf Club, the Cafe, the Bowling Club, and the RSA. We are on tank water, so please be super mindful of water use, during showers and washing up, especially during summer! Please maintain the quiet neighbourhood. No candles or smoking inside. Sanitary items to be disposed of separately, i.e. not to be flushed into the sensitive septic tank. Accommodation is for guests only, visitors ok via notice and permission. Art, Music, Coffee, Disco, Sundowners Relaxed and guest focused. We Love Piha! Charm, 100% Kiwiana, peace and views. Piha is super special to us. Private and well appointed. First house on the street. Wide views with intimate appeal. Shower, modern toilet and basin. Clean. High quality, bath and kitchen towels. Beach towels are available. CDs and 3.5mm jack for mobile device. NZ and international. A general mix. Lots of DVDs, movies and TV, also kid friendly. Deck wraps around entire house. Large with expansive beautiful sea and lush bush views. This place is a great base for everything Piha! Comfortable and cosy. There was everything and anything we needed at the house. Sunsets are amazing from the deck. We will be back for sure! Beautiful views, with all necessary facilities. Loved the plunger coffee. A charming Piha bach-style property. Beautiful views, great barbeque and facilities, best street in Piha - quiet and gorgeous, up above it all but close enough to the beach. Very easy, friendly and accommodating owners, made it all very straightforward. Would stay here again, absolutely. We thoroughly enjoyed our 3 night stay at this property. The view from the back porch is what makes it so special. For two people, it is a spacious property and has all you need. Luxury is not the key word here but it is comfortable and clean. Had great communication with the owners and the whole stay went smoothly. Be sure and take time to walk on the Mercer Bay Loop - spectacular views!